This post proves that one person’s culinary curiosity is another person’s comfort food. Yesterday I was shopping for lamb shanks at the combo meat/seafood counter my (very) friendly neighborhood grocery store. (I’d tell you what I did with the shanks, but afraid it’s for a magazine article later this year, along with a bunch of other holiday development I did; I’ll let you know when it comes out.) The woman next to me was going ga-ga over the big clams in the seafood case. There, nestled between the local tiny Manila clams and fillets of fresh halibut was a mound of big quahogs. These East Coast hardshell clams I recognized from my time as editor at Simply Seafood magazine, but I only knew them in an academic context. I’d never cooked them before. So after she’d nabbed her couple pounds’ worth, I bought myself some to play with. 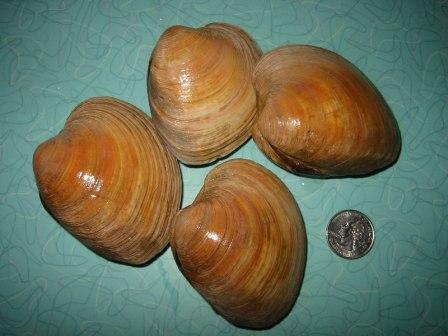 Four of the monster clams, each about 3 inches across, came in at one and a quarter pounds (that’s a quarter next to them in the photo). This classifies them as on the edge between large “cherrystones” or small “chowders,” from what I can tell after some quick research. The store’s seafood supplier had an overage and the manager bit at the chance to bring some into the store. He’d been surprised at how quickly they sold; maybe I’ll be seeing more quahogs there on a regular basis. My fellow shopper yesterday was the third or fourth East Coaster that day to go nuts over finding their favorite clam here in Seattle. She was rhapsodizing about how good they are raw (though preferably smaller versions) or in chowder. The fishmonger told me that a shopper the day before had told him about chopping up the clams, mixing them with a variety of things he couldn’t recall, then baking. I interpreted this to be a Clams Casino type preparation, inspiration for how I prepared the clams last night. After scrubbing the clams under cold water, I put them in a skillet with a few minced garlic cloves and about 1/2 cup dry white wine. Covered, I simmered them until the clams opened, 4 or 5 minutes. When cool, I removed the clams, saving the shells and the cooking liquids. 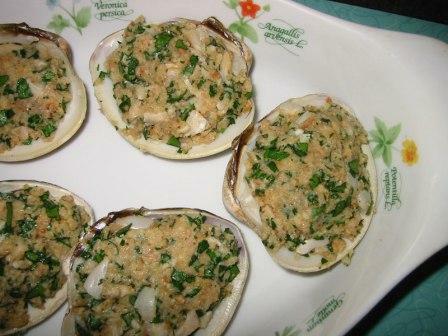 I chopped up the clams, added a good dose of chopped parsley, some more minced garlic, juice of 1 lemon, the cooking liquids and a couple shakes of dried bread crumbs. Spooned back into the shells, I baked the clams in a 500 degree oven for a dozen minutes or so. (I had some pancetta in the fridge that would have echoed classic Casino, but opted to leave it out so the flavor didn’t overwhelm the clams.) 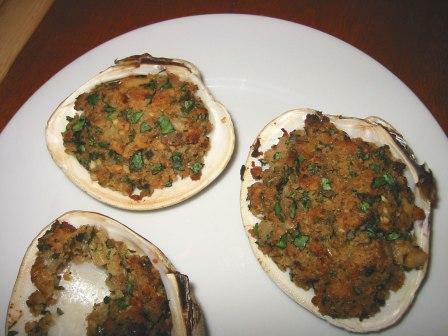 They turned out pretty well, though the clams were quite mild. I’d use less bread crumbs next time and keep the seasoning level low. Aside from trying a chowder one of these days, I would also use the chopped clams in a garlicky clam pasta dish, maybe a retro clam dip and baked on the halfshell with other flavor combinations. Did you grow up with quahogs? If so, I’d love to hear your favorite way to enjoy them.